Stopping by Neal Davis’ booth at any vintage stock car show he might attend is a miniature trip back to Memory Lane. Neal is typical of the dozens of men who express their love of the vintage aspect of our sport by building models of those long-gone stockers of the past. Auto model making in the 1950’s was an enterprise aimed primarily at young boys. Today, at least in my chosen arena – vintage racing preservation – model making is the realm of determined men – most of whom are consummate professionals at their art. Neal Davis stands proudly in his booth at the Swanzey Vintage Meet in 2005. Otto Graham’s website also features the work of builders like John Canfield, Mike Burley, and others. Some of these models are hard to distinguish from the real cars, especially if they are photographed with realistic backgrounds. I recall, as early as 1963, going to a race at the Claremont Speedway [then still dirt] and seeing models for sale at the concession stands. That got me going into the hobby for a number of years. The John Canfield model of the Floyd Geary – owned C38 of Buck Holliday is featured on Otto Graham’s website. 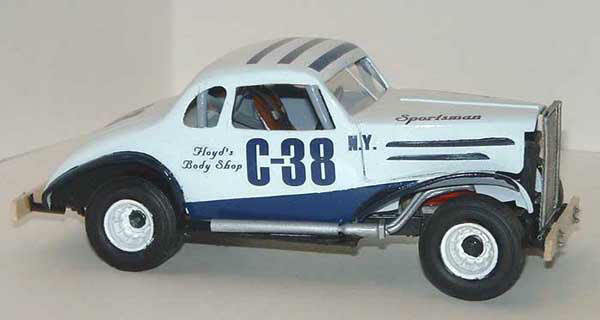 Before my budding sign business and three children born less than three years apart put the model making out of business for good around 1972, I had built models ranging from Fairmont Speedway cars, to Claremont cars, to Catamount cars, to a number of generic stock cars. It was both a frustrating and rewarding way to pass time. Among my favorites are a Ford driven by John Rosati at Catamount in 1971, a generic New York State upright sportsman coupe, the Pelletier / Falzrano #51 1957 Chevy of Russ Ingerson, Clem Despault’s 1955 Chevy #3, Pete Corey’s Studebaker, and a 1964 Ford LMS. This 1936 Chevy coupe model is mine. It includes engine wiring and a dashboard light that actually works. A lot of us can remember when Stock Car Racing magazine went through a phase of doing articles on guys who were building [in huge numbers] and selling models of the Grand National cars of the era. 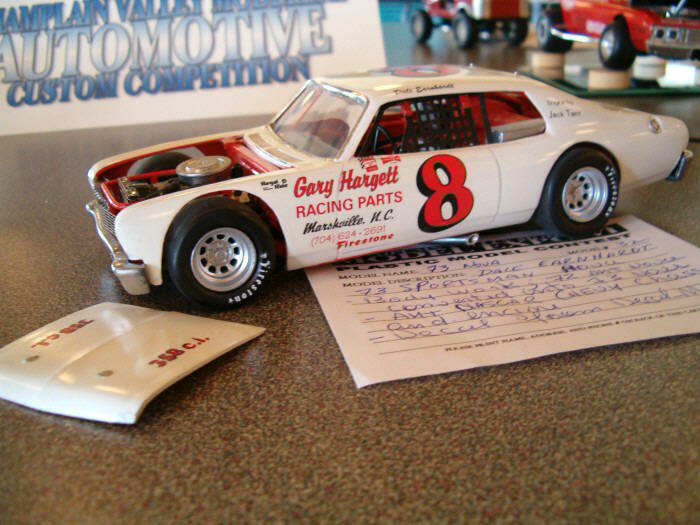 Besides someone like Cale Yarborough, you could actually have a model of a back marker like Dean Dalton or Big John Sears. Apparently a bunch of these really young guys actually toured with the Grand Nationals and sold the models at every venue. At the beginning of my teaching career [when I was still building models myself], I had my school host a few model shows for the kids. These were really neat affairs because, besides getting dozens of kids involved who might otherwise pretty much dislike school, we managed to have a number of great guests who would bring actually race cars to display for the excited kids. Over the course of the three or four times I did the shows, we had Bob Dragon bring both his dirt modified and one of his Catamount late models; Beaver Dragon brought his famous Vermont Mack Laughlin – built Nova; local driver Don Turner put in an appearance, as did Hurricane driver George Wells. Perhaps the most successful visit was the first one – the early evening show during which Don Bevins brought perhaps the most beautiful purple car I ever saw race at Catamount. Bevins’ father – in – law, Tracy Ryan, had been talking to me about the Bevins car before I ever got to see it at the races. We decided the car needed a pre- Spring Green debut of some sort. Hence, the model show idea was born. We got the kids whipped up to build models for a competition [and of course, in those days, Catamount Stadium was all the thing in Milton]. We scheduled the show for a nice May evening, when we’d have almost maximum daylight and decent temperatures. Wouldn’t you know, I would have a car appointment in Rutland, one and a half hours away that day. Having dumped my Renault at Charlie Shortle’s dealership in Rutland, I hopped in my brother – in – law’s Corvette and redlined it back up to Milton, slightly late for the opening. Fortunately, my friend John Sullivan had raided my model cabinet and some on display. Bevins pulls up after unloading the Dodge. Kids clutching their model entries move in for a look. Bevins arrived soon thereafter and the rest was gold. The Burlington Free Press and Catamount Stadium representatives were on hand. The kids and parents loved it – and Bevins was in his glory. An article came out a day or so later that headlined “Don Bevins Displays His Car With Pride”. 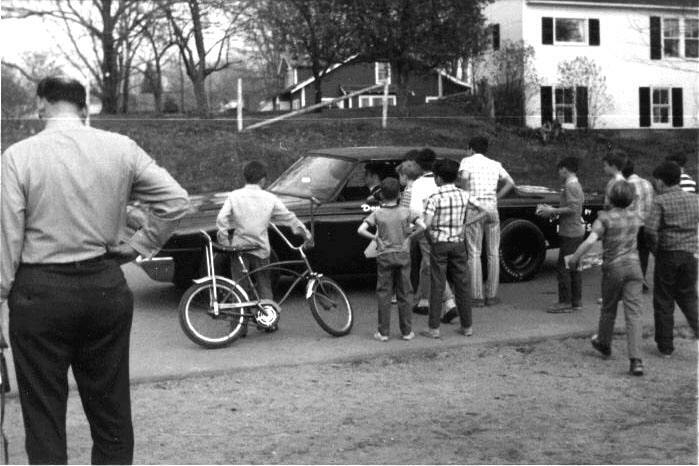 He went on to win a best – looking car award. Ironically, when he won his first – ever feature at Catamount, the car was missing th entire front nose of sheet metal. Today, we don’t have the same kind of fun at school any more. Too many technology tasks, skills assessments, and No Child Left Behind; gone are things like model shows, broom hockey tournaments at lunchtime in the winter, and hockey fan clubs who would chide their rivals by proudly wearing their Bruins, Flyers, or Canadiens colors to school. Fortunately, those boys of spring have grown up and still build their models. It is one of the important ways to preserve racing’s history. There are huge clubs that hold regular meets. I hear of this only through a few email buddies some of whose names I don’t even know. One Canadian fellow, Daniel Lynch, who goes by Mr. Chevy Black, sends me links to see photos of these meets. His clubs have put on displays in Canada and all over the northern US. In my particular region, I have shows at St. Albans, Vermont and Plattsburgh, New York mentioned on his fotki site. At the St. Albans show, a member of Lynch’s club [maybe even he] made this Dale Earnhardt model. To all those glue – stained guys [or gals] out there ruining their eyes doing miniscule detail on models of the race cars of our past – a big thank you and keep up the good work !